A Tough Time to Build a Life in the Humanities? Posted on June 28, 2015 by academicbookfuture	in academia and tagged arts and humanities, work-life balance. Academic books are not written, produced, sold, or read in a vacuum – contexts play an important part, and academia itself has a huge effect on the outputs (including books!) produced by those individuals embedded in it. Here, Greg Colón Semenza (Associate Professor of English, University of Connecticut) and Garrett A. Sullivan, Jr (Professor of English, Penn State University) talk about the difficulties involved in building a life as an academic in the humanities in current contexts. We are grateful to Greg and Garrett for using a slightly modified excerpt from the introduction to their new book as a basis for this post. 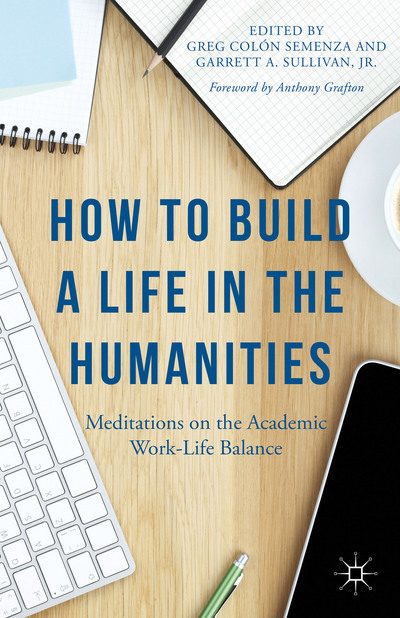 In our new co-edited collection, How to Build a Life in the Humanities: Meditations on the Academic Work-Life Balance, we set out to consider the basic but vexing issue captured in our title. Our initial thought was that while a lot of attention had been paid to the difficult endeavor of getting an academic job, relatively little emphasis had been placed on the crucial task of working out how to shape one’s existence in relation to that job. And, of course, no two people complete this task in the same way, especially given differences in gender, race, class, sexual preference, and so on. As our collection developed, though, we were repeatedly reminded of the extent to which, for humanists, the question of life-building is intimately bound up in the broader issue of the place of the humanities in society—as the following (slightly modified) excerpt from our introduction suggests. In spite of all the talk about the so-called “work-life” balance, we rarely stop to ask the simpler questions, such as how one might actually build a life in the Humanities? Certainly, the questions of constructing a career and a life are distinct, if inevitably interwoven. It’s one thing to say that scholars should work many hours each week, for example, but how are they to do so while trying to raise children, maintain a home, deal with personal crises, or manage the daily stresses of the office? While various forms of professional advice are readily available and widely disseminated, the issue of building an academic life remains comparatively underexplored. Graduate students and new junior faculty are amply oriented to their institutions, but not to the possible lives they might construct for themselves within the academy. The impact on our daily lives of twenty-first-century academic realities—increasing corporatization and administrative oversight, dwindling state support, decreasing employment opportunities for PhDs, and so forth—is too infrequently discussed in professional forums and publications, and almost never in spaces dedicated exclusively to the topic. Graduate students and younger faculty members especially, but also experienced academics navigating the murky waters of the mid-career phase, are often forced to deal with their personal ordeals alone, although such ordeals tend to be quite common. We believe that collective meditation on the personal side of academic life is both an ethical and practical obligation of those humanists who are in a position to share their experiences with others. One challenge we all face is negotiating the relationship between our lives in the humanities and in the outside world. Most of us have had awkward conversations at family reunions or holiday parties about our jobs. Some of us have been foolhardy enough to try to explain “what we are working on”; others have fallen back on partial and misleading truths. In both cases, we’ve often been greeted with blank stares or longing glances at the drinks cabinet. If building an academic life is a challenge for us, its workings are, to many of our interlocutors, a mystery they don’t care to solve. University professors have a lot less stress than most of us. Unless they teach summer school, they are off between May and September and they enjoy long breaks during the school year, including a month over Christmas and New Year’s and another chunk of time in the spring. Even when school is in session they don’t spend too many hours in the classroom. For tenure-track professors, there is some pressure to publish books and articles, but deadlines are few. Since writing the above piece I have received more than 150 comments, many of them outraged, from professors who say their jobs are terribly stressful. While I characterize their lives as full of unrestricted time, few deadlines and frequent, extended breaks, the commenters insist that most professors work upwards of 60 hours a week preparing lectures, correcting papers and doing research for required publications in journals and books. Most everyone says they never take the summer off, barely get a single day’s break for Christmas or New Year’s and work almost every night into the wee hours. If the Forbes article misrepresents the lot of the professor, it does so at a moment when the “University Professor” resembles an endangered species. Indeed, those of us with tenure-track jobs are aware that most graduate students, postdocs, visiting assistant professors, or adjunct faculty members would eagerly embrace our stresses. Our cultural moment is marked by a relatively long time to degree for Humanities PhD students; a dearth of tenure-track and full-time professorial jobs; relatively low salaries for those lucky enough to hold permanent positions and an absence of salaried jobs for everyone else; and, increasingly, a lack of public and institutional support for what we do, not to mention the types of skills we teach. This is a tough time to be building a life in the humanities. Moreover, even those of us fortunate enough to secure permanent employment are shadowed by the sense that we are not only overtaxed but also culturally marginalized. In proclaiming our stresses, we are also seeking legitimation. At the same time, we think that David Perry got it right: we love our jobs, and we feel profoundly lucky to have them, but they are extremely stressful. We build our lives around them, but they make it hard to live. Our book tries to account for many of the difficulties and joys attendant upon working in the humanities, in the twin hopes of making the process of building an academic life a little less mysterious or opaque and of clarifying for ourselves the humanities’ value to our own lives.